In our constant endeavour to provide you with better and relevant features, we introduced modifications to 6 key standard reports in December. GST specific information like GSTIN, GST registration, Type of customers, Suppliers, and HSN, and SAC code for items were made available in those reports. To help you customize your reports and to ensure that QuickBooks reports continue to be useful, we have taken our customer feedback to customize four more reports. What is New in QuickBooks reports? Four more of the QuickBooks standard reports will now have GST data included in them. These reports are – Customer Balance Detail, Supplier Balance Detail, Customer Contact List, and Supplier Contact. The inclusion of the GST data into these reports means that you can continue to use existing reports. With the GST specific information included, QuickBooks users can now view GST details of their customers and suppliers in the same report. These reports are related to contacts, and the GST data that can be added to customize the report are – GST registration type and GSTIN. How to customize reports to view GST details? 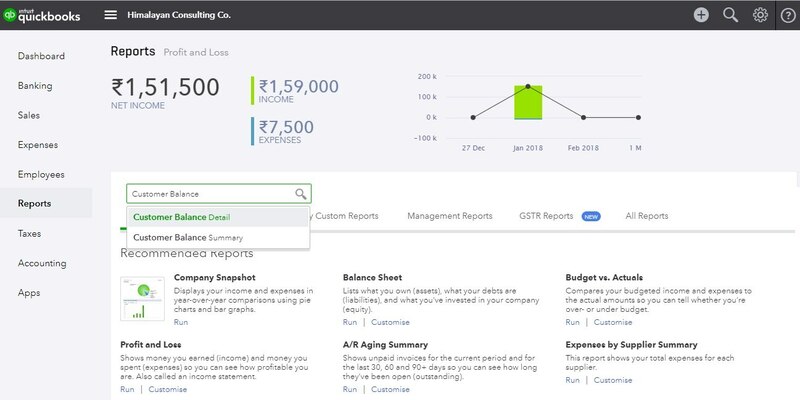 1- Sign-in to QuickBooks and click on ‘Reports’ in the left navigation bar and select the required report to be customized. (Eg. Customer Balance Detail, Supplier Balance Detail, Customer Contact List and Supplier Contact List). If you are unable to find the required report, use the ‘Search box’ to find it. 3- Check ‘GSTIN’ and ‘GST Registration Type’; then click ‘Run Report.’ Do not forget to save your customization. Should you have any questions about this feature, please log on to the QuickBooks Community; ask your question and a QuickBooks expert will answer it soon.